In this digital era, devices such as smartphones, iPads and laptops have become ubiquitous, leaving many feeling burned out by too much technology. Something as simple as laying back with an old-school transistor radio, like in the old days, can be all it takes to give us the digital detox we crave. adjust the channel, and enjoy listening to the news and music at home, in the garden or anywhere you are.It also supports aux output for playing out. (1) VELVET BAG INCLUDED: High quality velvet bag included with purchase, large enough to fit the radio and all accessories inside it and perfect for travel. (2) LOCK SWITCH FUNCTION- The “lock key” function is convenient for those who wish to carry their radio in their pocket. This special feature allows you to lock the buttons so that the station won’t be changed while bouncing around in a pocket. 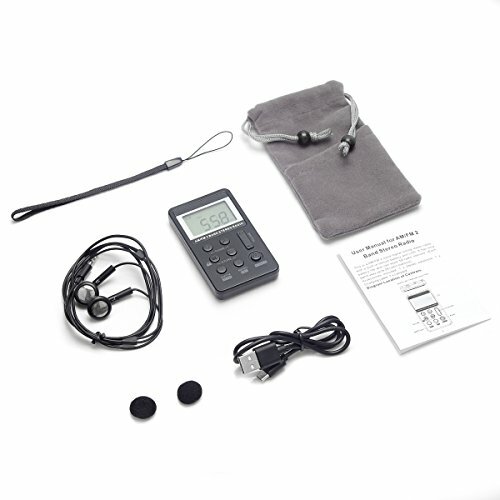 (3) EASY TO USE- Expertly designed with several simple buttons that are easy to operate and control. It is also suitable for seniors and children. (4) NO VISIBLE ANTENNA- Use the included earphone as antenna, saving you room and making the device even more portable. 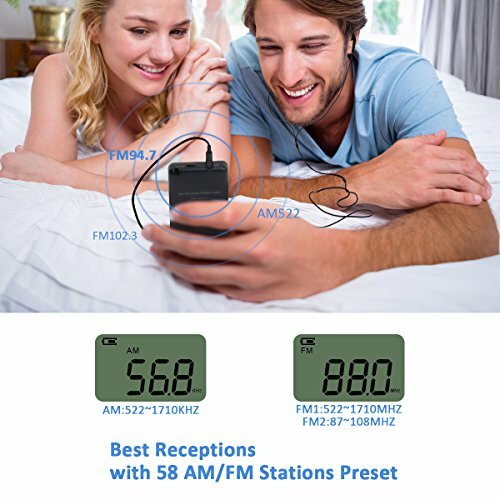 HIGH QUALITY RECEPTION AM/FM RADIO- Supports AM/FM 2 band stereo radio with an automatic search and store feature which can remember up to 58 of your favorite stations. Long press “Tuner +/-” and then it will automatically search Effective station and stop. 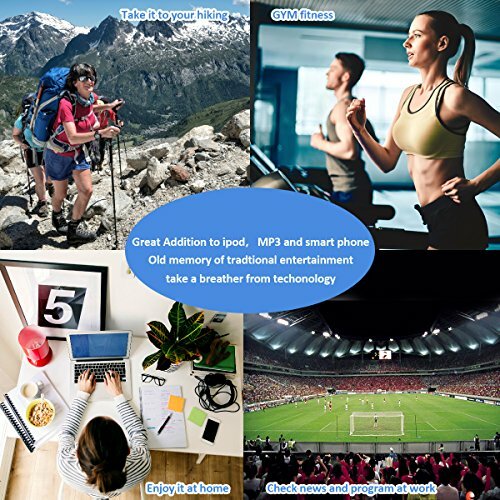 Crystal clear reception allows you to enjoy music, morning talk shows, sports games, etc anytime, anywhere. 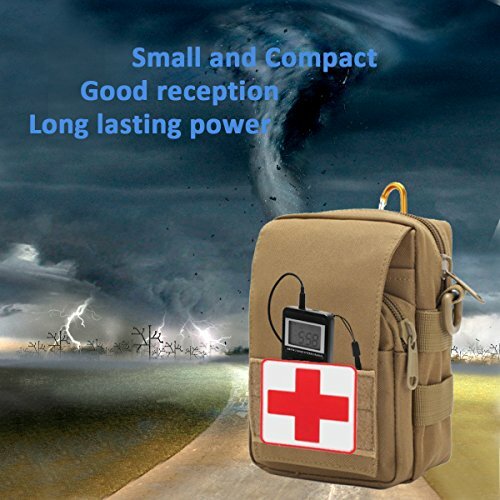 USEFUL EMERGENCY KIT- Be prepared in the event of a hurricane and other emergency cases as you will still be able to receive news via this tuning radio even when you have no cell phone or signal. When you don’t want to be interrupted by calls while listening to music via cell phone, use the retro personal radio as an addition. 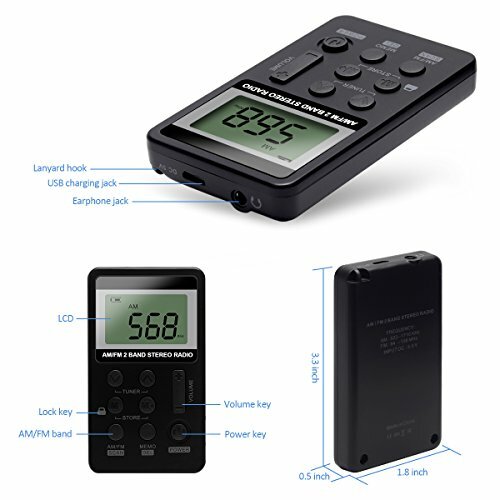 COMPACT & LIGHTWEIGHT- Highly portable, this thin hand-held radio is around the size of a credit card, and can slip easily into any pocket, handbag or glove compartment. Use it for jogging, walking around neighborhood, taking the dog for walk, doing sports at the gym, or traveling. It’s also an ideal gift idea for birthdays of kids or adults, Christmas, or ‘just because’. 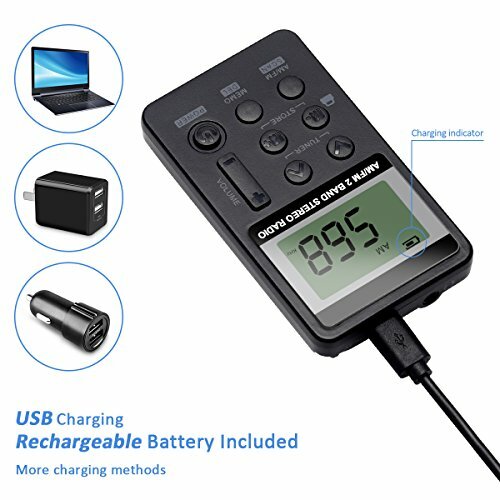 RECHARGEABLE BATTERY- No need to change batteries frequently, simply use the included USB cable to charge and the battery life will last up to 15 hours. A flash icon on the LCD screen indicates the radio is charging. 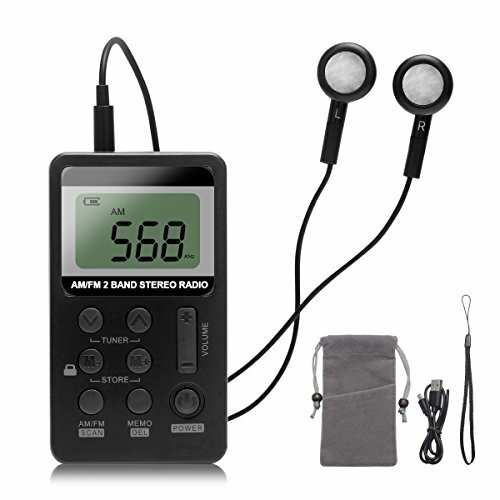 Save battery on your mobile devices by listening to music on your handheld radio instead. 1 YEAR MONEY BACK GUARANTEE- Accessories include a waterproof velvet bag, 3.5mm earphones, lanyard, and a usb cable. We are so confident in the quality of this handheld radio, we have backed it with a 1 year money back guaranty and exchange. Don’t hesitate to contact us by email if any problem occurs, we offer a lifetime of friendly after sale services.